Etching, Anonymous, 16 x 9.4 P; 15.5 x 9.1 L. Inscribed in the lower left corner with a monogram composed of the letters C and R.
Bartsch, XV, 1813, 437, under no. 2 of doubtful prints by Cesare Reverdino. Herbet, III, 1899, 42 (1969, 130), under no. 24. COLLECTION: Poughkeepsie, no. 86.19 (Hill-Stone, Inc., New York, Cat. no. 9, 1984, no. 29, Fig. 29). Béguin and Pressouyre, 1972, 135. Massari, 1983, 35, under nos. 5a and 5b (wrongly implying that it shows the entire scene of E.143). Carroll, 1987, 261, n. 1, under no. 81. 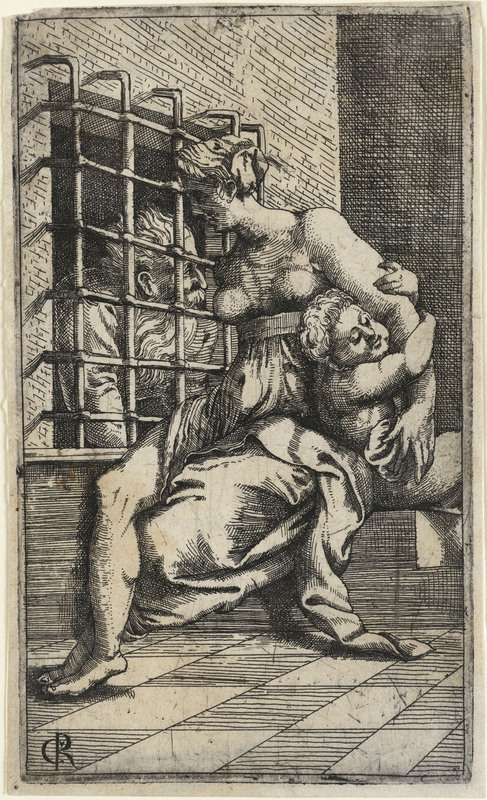 This etching would seem to be derived from the larger anonymous engraving of this subject (Fig.E.143, I). Only the central group of mother and child and father is reproduced, in reverse. The window is in correct perspective and its bars are aligned in accord with the orthogonal of the top of the window. The top of the bars is shown. The pavement is composed of square tiles. If copied from the other print, which seems most likely, then it was copied from State III of that engraving that shows the shadows cast by the bars of the window. Herbet, IV, 1900, 341 (1969, 191), 3, mentions that according to Renouvier there is a print of this subject by Jacques Prévost. But whether or not it is this print, or the larger engraving, or neither, has not been determined.